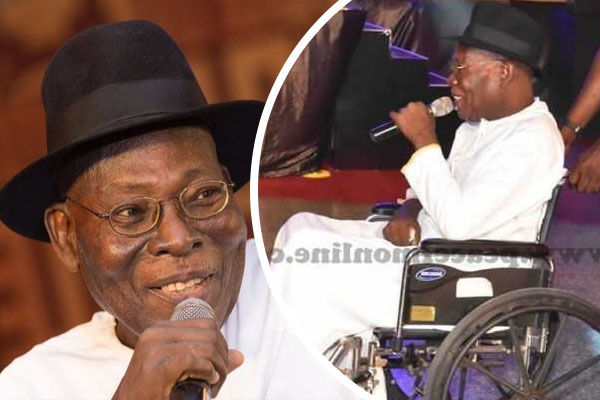 Highlife legend Paapa Yankson has died, StarrFMonline.com has learnt. The ‘Tena Me Nkyen’ hitmaker died in his Accra home Friday morning, his wife confirmed to StarrFMonline.com. The last time Paapa, as he was affectionately called, was seen in public was at the 2017 Vodafone Ghana Music awards where he picked the lifetime achievement award in March this year. His popular songs include; Wiase Mu Nsem, Show Your Love, Wo Yere Anaa Wo Maame, and Tena Menkyen. Benjamin Paapa Kofi Yankson was born on June 22, 1944 at Winneba in the Central region. His latent music flair was discovered at the funeral of a neighbor. He landed his first music contract during his mother’s funeral. And for more than 30 years Paapa Yankson has produced music that has brought life to many dead souls. Even though both of his parents were musicians, they didn’t want him to take up singing. Instead, they wanted him to have a white collar job. His father, Benjamin Akono Yankson, was a reputable trumpeter with the Apam Brass Band while his mother Akua Doma, a trader, was a member of the Christ Little Band of the Methodist Church. According to him, anytime his mother sang while doing her house chores, he sang along with her. He was instrumental in the projection of music bands into critical national acclaim- the Western Diamond Band, The Gold Nuggets Band and the Carousel Seven Band. He has lectured and performed in many countries around the world including the US, Canada, Belgium, Britain, Germany, Holland, Nigeria, Benin and the Ivory Coast.